Growing up, my grandmother used to take care of me, and I used to bother her a lot. I was always looking for something to do. She used to tell me to go outside and play basketball to work my energy out. Playing basketball helped me to get things off my mind. It was a big relief. Later, as a teenager, I learned about a basketball program that Father O'Brien ran at St. Patrick in Lawrence. At that time, things weren't going very well for me. My family wasn't there for me, I didn't have a steady home, I had two jobs, and I was struggling just to find food to eat. I went all the time to play basketball and, to be honest, to enjoy the food that was there. I spent a great deal of time on the court and at those games. One day, I had an altercation there. Father Paul pulled me aside, knowing this was not how I usually acted with others, and said, "You really need to tell me what's going on." I was ashamed to tell him that by that point, I was homeless and living in my car. I was afraid to tell people about it; even my closest friends and family members did not know. In the course of our conversations, Father Paul asked me what I dreamed of doing with my life. I told him I had always wanted to go to college but did not have the means to get there. 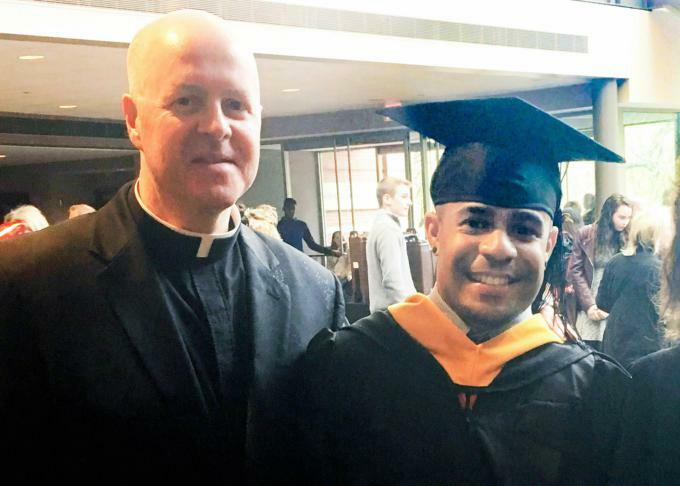 Father Paul said he would help me, and he encouraged me to work hard and chase my dream. This was a big moment for me because no one had ever suggested something like that to me. Not my family or friends, not my teachers -- no one. Father Paul eventually made some calls and got me an interview at a local college. This was incredible to me, and my life-long dream of a college education started to become real for me. I always had the dream of going to college, but I never thought I would actually be able to do it. With the help and guidance of Father Paul, I was able to attend Regis College, where I also became a member of the basketball team. Through my years at Regis, Father Paul was always there for me, checking in about my class assignments, even arguing with me about finishing my homework. I'll never forget the day I graduated from college. I was speechless. And Father Paul, my mentor and my friend, was there, yet again, to support me. Father Paul has been a role model for me at every step of my journey, helping me to navigate several difficult life challenges. He has taught me that treating others with kindness and respect can go a long way, even if I have to keep a distance from them because they have wronged me. Simply put, Father Paul changed my life. I now work as a school guidance counselor and try to give back to other young people the kind of hope and inspiration that Father Paul gave to me. As we celebrate Easter with our families and friends, please remember the Boston priests who have helped us along our life journey and consider making a gift of thanks to the special Easter collection that supports Boston priests who answer God's call every day. HECTOR HEREDIA PLAYED IN THE BASKETBALL LEAGUE AT ST. PATRICK PARISH IN LAWRENCE, WHERE FATHER PAUL O'BRIEN IS THE PASTOR.